Sometime last summer, my friend Amy from Missouri emailed me. 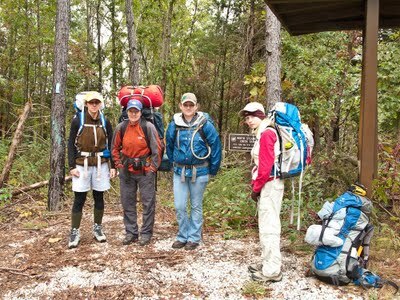 Amy car-camps a lot, and she canoe-camps, and she even did a four-day camp trip in Mammoth cave recently. 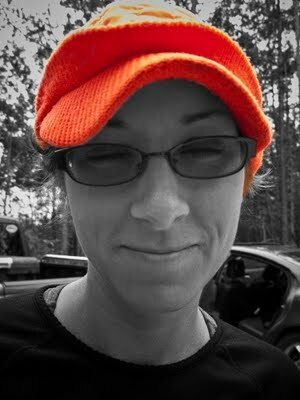 But she hadn't gone on a backpacking trip in years and so we compared schedules and set up an all-girl trip to hike the Sylamore Trail, north of Mountain View. Originally we'd planned to hike from Allison to Barkshed, the length of the old standby Sylamore Trail. But it's rained and rained, and I change plans every day, all week. I don't want to do the creek crossing at Allison. The Blanchard campground's closed. 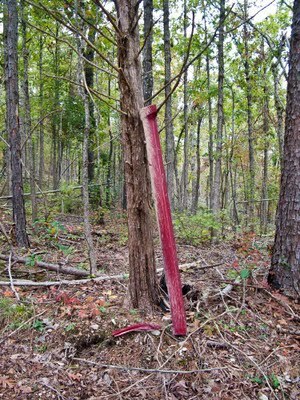 I hear from the ranger office in Mountain View that the new extension trail -- the connection between Barkshed and the OHT -- has reopened after months closed due to ice storm damage. So we plan to hike the new extension and then the old trail from Barkshed to Gunner Pool. 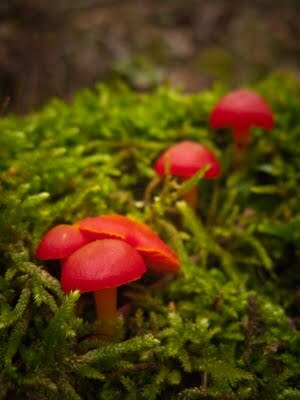 We hope that the wet weather will mean there will be lots of waterfalls and mushrooms to see. Mandy and I pick up Debbie in Little Rock and we meet Amy and her friend Catherine at Gunner, where we spend the night listening to the creek. The morning is beautiful. Arriving at the Cripple Turkey trailhead around ten, we load up our bags, lock the car, and take our group photo before someone points out that the trailhead marker has no signage posted except for a big "THIS TRAIL IS CLOSED!" I insist that just yesterday a ranger in Mountain View had said it was fine, so we ignore the sign. It's a sobering walk. Almost immediately we're in the middle of shockingly bad ice storm damage, right on the trail. 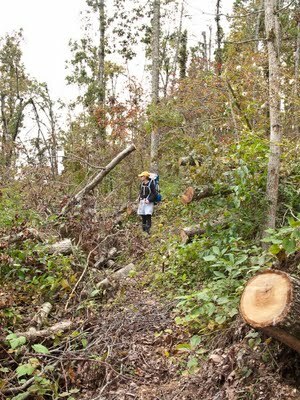 Limbs are cut and stacked to the sides of the trail, in places head-high for a hundred feet. We have to carefully navigate around huge holes in the trail made when whole trees fell under the ice, pulling up their root balls. 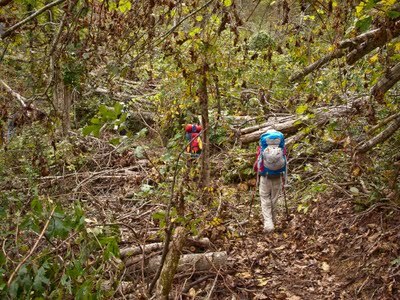 The trail follows near the 900 foot contour line in this area, which is exactly the spot where the damage was the worst. The destruction is staggering. They've done a great job of clearing, but the amount of work required to make the trail passable has been immense. 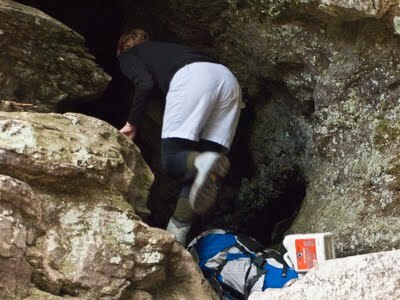 The trail also runs near a number of tantalizingly dark holes in the ground, and all of us are, after all, cavers. Amy is particularly inclined to notice them, and particularly itchy to explore. We laugh as we remind her that we're hiking today, not caving, and she grudgingly stays on the trail, most of the time. 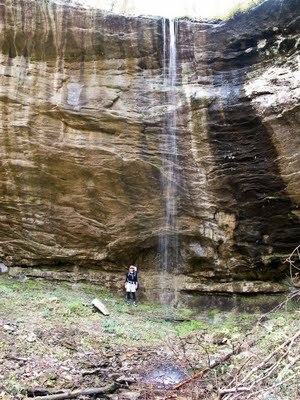 We hike past some very pretty waterfalls, including one in Amy's 'Arkansas Waterfalls' guidebook. 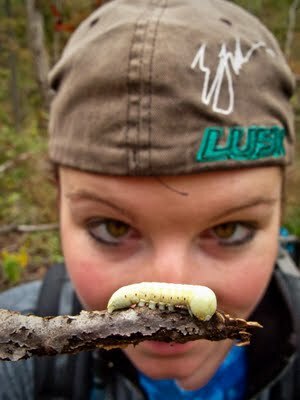 It was one she'd found and wanted to see, but didn't think we could afford the time for the side hike from the road. We are all pleasantly surprised to find that the new extension trail passes right by. From another cascade, we catch water in the folding bucket, and filter it for later use. I fuss at Mandy for getting so wet but then realize that it's impossible not to. 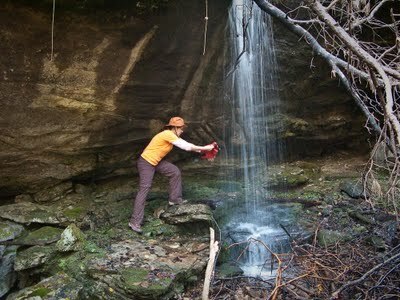 We notice with interest that none of these waterfalls feed into streams, but sink immediately into rocks and head underground. 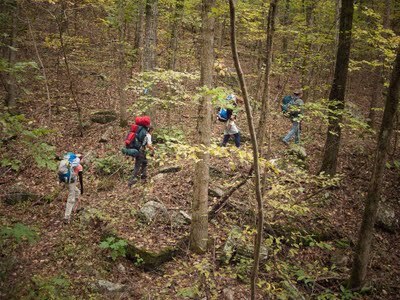 We make camp a mile or so upstream from Barkshed, near the top of a wooded hill. After pitching tents and making beds and cooking supper, Debbie shows us how to properly hang a bear bag. (Those damned lazy Ozarks backpackers!) 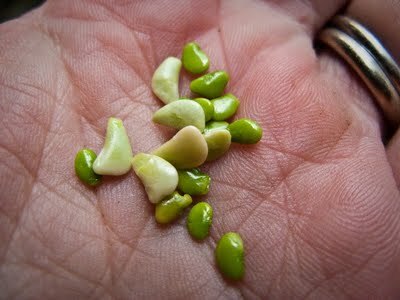 Mandy shells stick-tites and discovers that their insides look suspiciously like tiny lima beans. It rains a bit just at dawn, but stops in time for us to make breakfast and pack up. The walk between our camp and Barkshed gets even prettier, with long views down toward Sylamore creek. At Barkshed the nature of the trail changes a lot: we switch from hiking on new, spongy, overgrown paths to walking on the solid, packed, moss-covered old trail. As pretty as the new extension is, this old standby section is still my favorite: the views are wonderful, and much of the trail follows the edge of a bluff, sometimes undercut to form a roof over our walkway. There are springs and cascades running over the rock. We descend and hike just next to the creek for a bit before joining the gravel road that takes us to Gunner Pool. We drive back up to get the Subaru, parked at the far trailhead. On the way out, Debbie sits in the passenger seat, talking about a piece of car she's seen leaning up against a tree some yards back. It's red. It's actually just exactly the color of OUR car. I sigh and stop in the middle of the road, and we walk back to pick up two big pieces of trim that have fallen off my car. We shove the muddy chunks of car into the hatch, completely surprising Mandy, who's got her nose in a book and has missed the whole conversation. Amy puts on this fabulous hat and she and and Catherine head back to Missouri. But Debbie and Mandy want to go on a Blanchard tour. $41 later, we own even more bat shirts and have made yet another visit to a favorite place. It was a good weekend spent outside with strong women, good cavers, valued friends. The quote of the weekend came at the very end, from the cave-tour guide: "Those men who discovered this room, they really liked to cave. Why, they'd come into the cave and just explore, for fun. They even brought their WIVES down here, sometimes!"